Welcome shade, in CADPAT digital camo. 3 Hats, 1 low price! 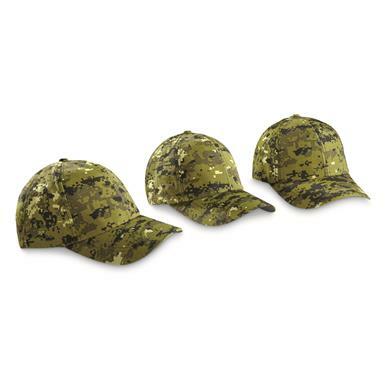 If your passion is camo, these Ball Caps are guaranteed winners. Built to keep Canadian operatives comfortable under high-activity and scorching temps. Great for summer hunts, kid's sporting events, or just getting chores done in your backyard. Eye-catching CADPAT camo is the latest digital pattern in use by Canadian Forces, designed to reduce detection both by enemy eyes as well as night vision devices. A solid Cover to stay in the action! Get yours!